*Update* See below for updates about booth signings. Yes, folks, hard to believe it is already time for us to all fly to Indy and gather up for the most amazing time for tabletop game playing. And boy, are a bunch of folks gonna be playing our games. We’ve set a GenCon record, for us, that is, and we’ll have 90+ games on the Gen Con Schedule this year. Last but not least, ORK! There are a few games which haven’t sold out, as we’ve added them recently. 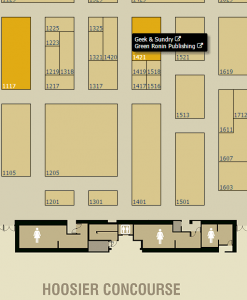 You can do a search on the Gen Con site for Green Ronin Publishing to see the entire schedule. You are always welcome to drop by any of our games to see if the GM can take an extra or there is room to play. Bring some Generic Tickets, your dice, and get ready to play! We’ll be featuring demos of Love 2 Hate by Designer Colm Lundberg in the booth, so make sure you stop by and get in a quick game with him. 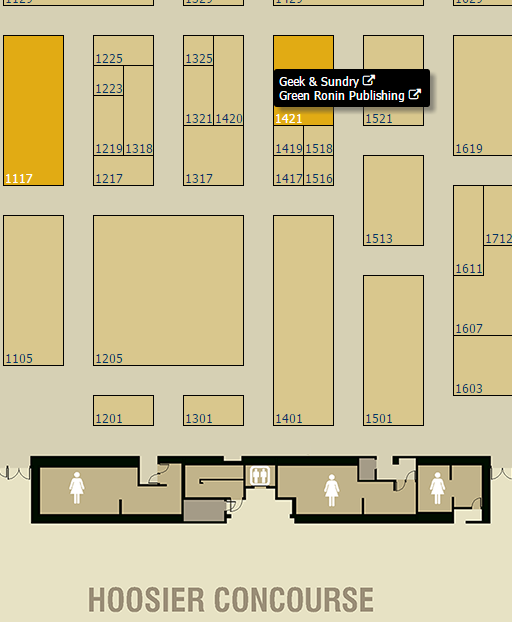 We’re also pleased to be hosting Geek & Sundry in our booth again. You’ll be able to get your photo taken and roll the big d20 to win posters. We gave away so many last year; you’ll want to hit us early to make sure you get your chance to win each day. We are also very pleased to announce three new titles available as of GenCon: Hero High for Mutants and Masterminds, the Fantasy AGE Bestiary, and the epic campaign Dragon’s Hoard, for A Song of Ice and Fire Roleplaying! We are excited to be hosting the seminar , “Q&A with Critical Role” on Friday , at 11:00 am . The Seminar is FREE, so be sure to sign up to get your tickets. Right now, there are about 700 tickets still available. Just look for SEM16100967. Also, we’ll be doing some signings in the booth. Be sure to check in at our booth for more information! Can’t attend the Critical Role Seminar? Well, maybe you’d love to attend the Critical Role Live! Event on Saturday, 8:00p. Geek & Sundry is hosting this event at the Hilbert Circle Theatre . This episode will feature Matt Mercer, Marisha Ray, Ashley Johnson, Laura Bailey, Taliesin Jaffe, Sam Riegel, and Travis Willingham. We’ll have plenty of Critical Merchandise, too, so get your tickets today! We’ll have booth signings for some of the Critical Role/Titansgrave cast on Friday. The first 50 people in line at 12:30pm will be able to have their swag signed by the following cast members below. On Saturday, we’ll have the wonderful Arnold T. Blumberg and Scott Alan Woodard, authors Cinema & Sorcery. We will also have more booth signings announced right here, as soon as we have them scheduled. Gaymer/Ally Ribbons! The Tabletop Gaymers group is making ribbons again. Stop by and talk to Donna for your Ribbon. Show your PRIDE with us! Once again, our amazing Ronins Steve Kenson & Joe Carriker will be participating in the Queer as a Three­Sided Die panel. As it is every year, it is sold out. But if there are available seats, you can still get in! The Seminar is Thursday, at 3:00pm. Find it under SEM1692527. Ronins Nicole Lindroos and Donna Prior (that’s me!) are both going to be on the Industry Insider Seminar track. Nicole is on the Industry Insider Advisory Board and Donna was selected as an Industry Insider for 2016. Yes, Donna can write in 3rd person if she wishes. GAME ON AND HAVE A BLAST!